The Hellenic Armed Forces (Greek: Eλληνικές Ένοπλες Δυνάμεις, Ellinikés Énoples Dynámis) are the combined ground, naval and air forces of Greece. They consist of the Hellenic National Defense General Staff, the Hellenic Army, the Hellenic Navy, and the Hellenic Air Force. The civilian authority overseeing the Hellenic Armed Forces is the Ministry of National Defense. Greece currently has universal compulsory military service for males from and over 18 years of age. Under Greek law, all men over 18 years of age must serve in the Armed Forces for a period of 9 months. Women can serve in the Greek military on a voluntary basis, but cannot be conscripted. According to NATO sources in 2008, Greece spent 2.8% of GDP on its military, which translated to approximately €6.9 billion (US $9.3 billion). In 2008, Greece was the largest importer of conventional weapons in Europe and its military spending was the highest in the European Union relative to the country’s GDP, reaching twice the European average. Data for the 2017 fiscal year showed an estimated expense of €4.3 billion in constant 2010 prices, or €4.2 billion in current prices, equivalent to 2.38% of GDP (+0.01 change since 2016). For the 2018 fiscal year, the expenditure was estimated at €4.3 billion in constant 2010 prices or €4.1 billion in current prices, equivalent to 2.27% of GDP (-0.11% change since 2017). Military personnel was estimated at approximately 106,000 for year 2017 and 105,000 for year 2018. Greece is an EU and NATO member and currently participates primarily in peacekeeping operations. Such operations are ISAF in Afghanistan, EUFOR in Bosnia and Herzegovina and Chad, and KFOR in Kosovo. The Hellenic National Defense General Staff has the operational command of the Joint Armed Forces Headquarters and the units that operate under them. It is also responsible for organising and implementing routine operations and exercises of the Joint Armed Forces, coordinating and implementing operations during the management of wartime and piecetime crises and overseeing operations of the Hellenic Armed Forces outside Greek national territory. The basic components of the Hellenic Army are Arms and Corps. The former is responsible for combat missions and the latter for logistical support. It is organized in Commands, Formations, and Units with the main being brigade, division and corps. Its main mission is to guarantee the territorial integrity and independence of the country. The Hellenic Navy incorporates a modern fleet consisting of strike units, such as frigates, gunboats, submarines and fast attack guided missile vessels and multiple types of support vessels, in order to be able to conduct naval operations that protect Greek national interests and guarantee the integrity of Greek territorial waters, the mainland and the islands. The Hellenic Air Force incorporates a modern aircraft fleet and congruent structure, combined with a comprehensive air defense system that consists of a widespread network of anti-aircraft weapons. The structure, which is overseen by the Air Force General Staff, includes the Tactical Air Force Command, the Air Force Support Command, the Air Force Training Command and a number of other independent defense units and services. Its’ main mission is to defend Greek airspace and to provide combat support to the Hellenic Army and the Hellenic Navy. ^ "Defence Data Portal". eda.europa.eu. Retrieved 27 March 2018. ^ a b "Greece - Military Spending". globalsecurity.org. ^ Frank Slijper (April 2013). "Guns, Debt and Corruption Military spending and the EU crisis" (PDF). Wikimedia Commons has media related to Military of Greece. 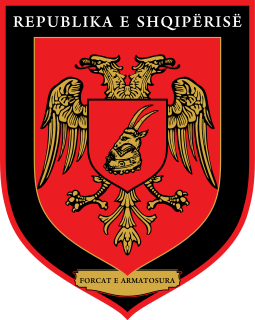 The Albanian Armed Forces are the military of Albania and were formed after the declaration of independence in 1912. Today, it consists of: the General Staff, the Albanian Land Force, Albanian Air Force and the Albanian Naval Force.